When a virus infects a cell, it has an important decision to make – whether to kill the host (lysis) or to integrate its DNA into the host genome (lysogeny), entering a state of dormancy. This anthropomorphic view may not be far from the truth. A recent study by Zohar Erez and colleagues in Israel, published in Nature, demonstrated that a small signalling peptide used mediates the lysis-lysogeny decision. This is the first time that such a messaging mechanism has been found in viruses and it is hoped that this new understanding can be used to provide viral treatments for life-threatening infections such as HIV. Figure 1. 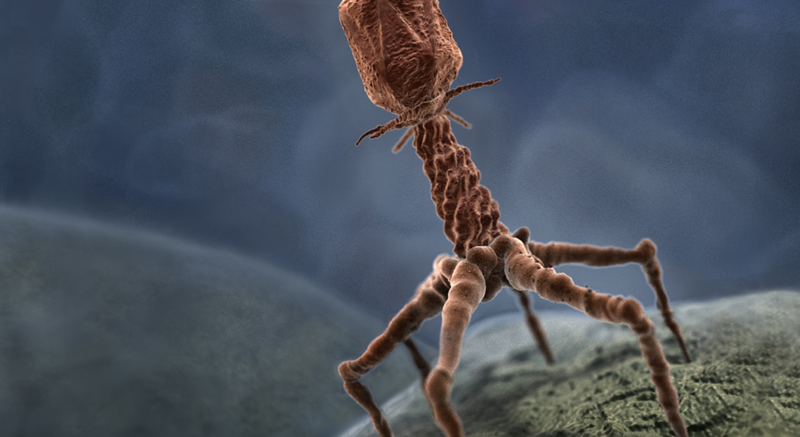 A bacteriophage infecting a host with its genetic information. Viruses come in many types, each infecting specific cell types. The Israeli team’s discovery of a small signaling peptide was made in phi3T, a bacteriophage virus that infects Bacillus subtilis. It is proposed that progeny phage measure the concentration of this small peptide – a higher concentration coordinating the lysogenic response. This contrasts to previous experiments in phage Lambda, that infect E.coli, that use the nutritional state of the host to inform their choice. What makes this new finding exciting is the fact it was unexpected. The researchers were initially searching for secreted molecules in bacteria to warn others of phage infections. Their experiment involved infecting a culture of Bacillus for three hours with phi3T eliciting the lysis pathway. Filtration was used to separate small molecules from the culture, and were subsequently added to a fresh batch of Bacillus which was again infected with phi3T. Compared to a control culture without these added molecules, the conditioned media had a much higher proportion of bacteria protected from lysis. An ingenious set of experiments by the team was used to determine the function of the mystery molecule. When a protein degrading enzyme was added to the conditioned culture, the lysis protection was lost, implicating a peptide signal. The second test involved deleting a transporter membrane protein from the bacterial genome that brings proteins of 3-20 amino acids into the cell. This resulted in enhanced lysis, suggesting that this peptide may promote lysogeny. Combined, it was deduced that as the peptide increased in concentration on phi3T infection it acted as a communication agent influencing the lysis-lysogeny choice of later generations of phage. With this information, the team named the molecule ‘arbitrium’, after the Latin word for decision. By sequencing and analysing the genome of phi3T, the researchers could map the genetic basis of arbitrium. 3 phage genes have been found that underpin the communication system: aimP, that encodes arbitrium, aimR, an intracellular peptide receptor that is a transcriptional activator of aimX, a negative regulator of lysogeny. Binding of the arbitrium peptide to aimR leads to the dissociation of the receptor from a DNA region upstream of aimX. Without aimR, the expression of aimX is greatly reduced, relieving the repression for lysogeny. Consequently, when there is a high concentration of arbitrium it will be brought into the bacterium and will interact with aimR. The interplay of these three proteins effectively switches the phage’s choice from lysis to lysogeny. The logic behind this mechanism is clear. When a single phi3T stumbles across a colony of bacteria, it is in phage paradise. There are plenty of resources available for it to replicate and produce ample progeny, lysing a vast number of bacteria. However, as phi3T increase in population size, the bacteria diminish. Therefore, subsequent progeny are at a greater risk of not finding a bacterial host to infect. At this stage, it will be more adaptive for the phage to remain dormant in the host. So, when there are lots of phi3T, there will be a high concentration of arbitrium triggering this switch to lysogeny. The presence of arbitrium alone does not lead to 100% lysogeny, suggestive of supplementary mechanisms in the decision process. Nevertheless, Erez et al. findings will serve research in viral treatments. Future studies will be focused on whether this same strategy is used by viruses that infect eukaryotic cells, such as human. If this is found to be the case, by increasing the concentration of the arbitrium peptide, the disease-causing viral infection could be forced into a state of dormancy, perhaps preventing the disease forever!